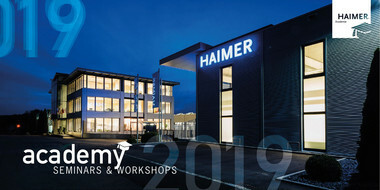 In the state-of-the-art HAIMER Application Center, we have started the first workshop series of the HAIMER Academy with great success in June 2018. The seminars and workshops offered are aimed in particular at engineers, foremen, production managers, milling machine operators and tooling professionals who want to optimize their processes in the area of tool management, tool set-up or machining. Take your chance and sign up for your next workshops in 2019 now! The HAIMER Academy was founded with the objective to answer our customers' requests by providing even better support. In this sense HAIMER experts share their expertise regarding application issues and process analysis methods with the aim of long-term, future-oriented optimization including cost savings potential for our customers. The fee-based courses take place in the HAIMER Application Center with seminar room, a comprehensive test environment for machining trials and a fully equipped tool management area. Three state-of-the-art machining centers for tests, comparisons and applications for a wide variety of industries (HSC, aerospace, general mechanical engineering). Your benefit: Learn from our application experts how to optimize processes! Please note: The first round of courses will be conducted in German language. Several languages are possible according to demand and group sizes. Feel free to contact us, if you wish to participate in your native language!